Agusan River is a river in the Philippines, located in the north-eastern part of Mindanao island, draining majority of the Caraga region and some parts of Compostela Valley province. It is the country's third largest river basin (after Cagayan River and Rio Grande de Mindanao) with a total drainage area of 11,937 square kilometres (4,609 sq mi) and an estimated length of 390 kilometres (240 mi) from its origin. The headwaters of the river are found in the mountains of Compostela Valley, near its border with Davao Oriental and east of Tagum City. It flows through the wide Agusan River valley which measures 177 kilometers (110 mi) from south to north and varies from 32–48 kilometers (20–30 miles) in width. It finally drains into the Butuan Bay at its mouth in Butuan City. One of the prominent features in the Agusan River basin is the presence of the Agusan Marsh covering a total area of 19,197 hectares (47,440 acres). The marsh serves a flood retention basin for the Agusan River, cutting the high discharge of water causing flash floods in the lower reaches of the river. Aside from that, the marsh harbors unique and pristine habitats like the sago and peat swamps forest and is a home to endangered and endemic flora and fauna. As a consequence, it was designated a wildlife sanctuary by then-President Fidel V. Ramos in 1996. The Agusan River basin is divided into three sub-basins on the basis of topographic features: the upper Agusan River basin, the middle Agusan River basin, and the lower Agusan River basin. The upper Agusan River basin is the section from its headwaters in the mountains of Compostela Valley province to Santa Josefa, Agusan del Sur to Veruela, Agusan del Sur, the middle Agusan River basin is the section of the river from Santa Josefa to Amparo, Agusan del Sur while the lower Agusan River basin is from Amparo to its mouth at Butuan City, Agusan del Norte. ^ a b "Agusan River - River, Philippines". www.britannica.com. Encyclopedia Britannica. July 20, 1998. Retrieved 10 April 2017. ^ Kundel, Jim (June 7, 2007). 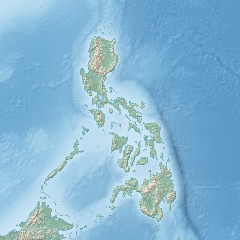 "Water profile of Philippines". Encyclopedia of Earth. Archived from the original on 21 September 2008. Retrieved 2008-09-30. ^ a b "Technical Assistance To The Republic of the Philippines For A Master Plan For the Agusan River Basin" (PDF). Asian Development Bank. December 2004. Archived from the original (PDF) on 2007-07-13. Retrieved 2008-08-09.